A central location, sandy beach and extensive facilities make this the perfect holiday base. 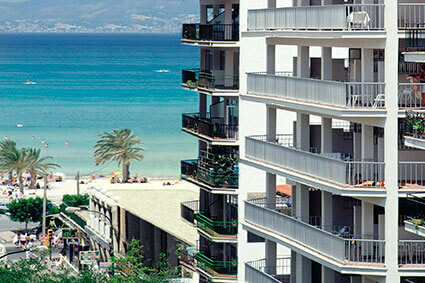 Blue Sea welcome you to the 3-star Hotel Costa Verde Mallorca, located in the popular beach town of El Arenal. Set close to the white sandy beach and a range of shops and restaurants, the hotel boasts a large outdoor pool and restaurant, making this the ideal place for a wonderful holiday to Majorca. The Blue Sea Hotel Costa Verde is home to 124 spacious rooms, fully equipped with air conditioning, heating, fans, satellite TV and a safe. Many rooms have balconies overlooking the sparkling pool or the pretty gardens for relaxing evenings watching the sun set in the privacy of your room. Blue Sea Hotel Costa Verde Mallorca features an outdoor swimming pool for adults and another pool for children. The pools are surrounded by a spacious sun terrace complete with sun loungers and pleasant trees perfect for providing a spot of shade from the hot Majorcan sun. For a fantastic, family-friendly holiday to Majorca, stay at Blue Sea Costa Verde. These 15m2 rooms are spacious and styled in a Mediterranean fashion. Each room comes with twin beds, private bathroom, air conditioning, free Wifi, heating, fans, satellite TV and a safe. Many rooms have balconies overlooking the pool or the garden. Quadruple rooms are very spacious at 28m² and have neutral Mediterranean décor. 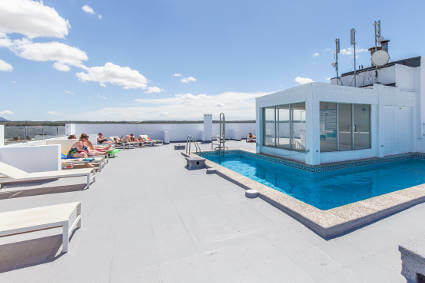 Each room has bunk beds and single beds, a private bathroom, air conditioning, heating and a fan, free Wifi, TV and some of them have a balcony overlooking the pool or gardens. These 9m² rooms are neutrally decorated in Mediterranean style and come with a single bed, private bathroom, air conditioning, heating and fans, free Wifi, TV and some of them have a balcony overlooking the sparkling pool or gardens. The Costa Verde Hotel Majorca offers an affordable all-inclusive package which includes three delicious buffet meals a day. All-inclusive guests can also enjoy a range of snacks and drinks throughout the day. Choose from soft drinks, water, hot drinks and alcoholic beverages like local beer, wine and spirits until 23.00. Half board: International breakfast and dinner buffet. Drinks are not included. The capital of Majorca, Palma is just a 10-minute drive away, or can be accessed by a bus from just outside the Hotel Costa Verde. The city offers guests a huge and bustling variety of shops, eateries, attractions and sights to enjoy on a holiday to Majorca. For a taste of Majorcan culture, don’t forget to visit the city cathedral and beautiful Almudaina Palace.